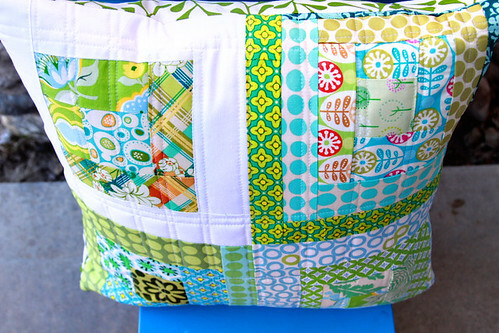 Stitches and Scissors: A sewing frenzy! Today I woke up and just wanted to sew. Awesomeness! I have been so out of it with sewing since the move and my stuff not being organzied but I got my mojo back today and sewed like crazy. 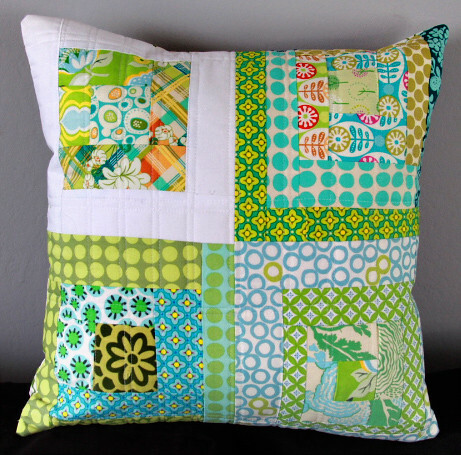 First I made a pillow to go in my room to match the quilt I am making. 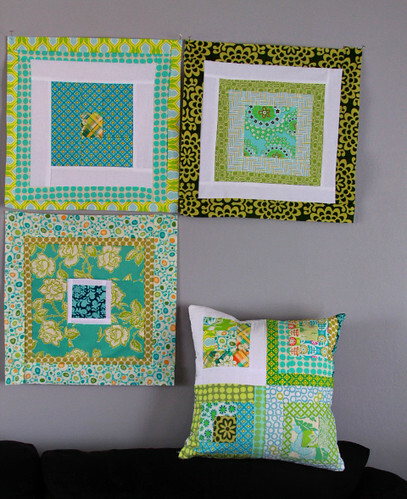 I have my blocks for the quilt on my design wall (aka living room wall) for now. I am just so in love right now it is crazy! These colors are sooooo me. I did straight line quilting on this one down and across and it is perfect. Then after that was done I finally gave in to Gwen. She has been begging me like crazy to make a blanket for Pooh. I was hoping she would forget soon since I joined in the Doll Quilt Swap 10 and was hoping for a quilt for her but oh well. I can always use it on my wall in my sewing room and also I bet Gwen will use a billion blankets if she had them. Gwen picked out all the fabrics and told me that she wanted all colors and it to be a rainbow. We got the top done and went to baste it but found out I am all out of batting pieces that are big enough. Hopefully tomorrow we can go to JoAnn's and buy some because apparently Pooh is FREEZING! So we must hurry :) Oh to be a (almost) 4 year old. 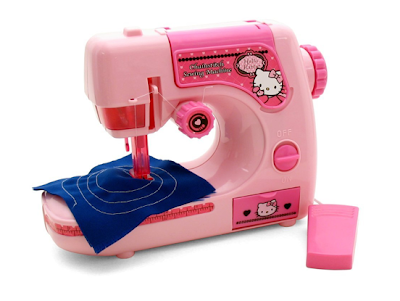 On that note I found this super cute sewing machine that I am going to buy her for her Birthday. I just wish it came in blue since that is her favorite color, but oh well. What do you think? Has anyone bought this? How is it? Super cute machine! I know Monica www.thehappyzombie.com has a HK machine, I think hers is turquoise. Not sure if it's the same make or model though. 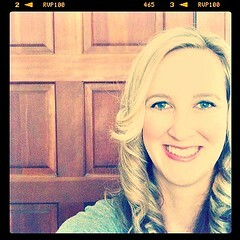 I've just discovered your blog, I like your style! Awesome Darci! I love the pillow!! look who's hording the green wallflower print! :) cute lil quilt for Pooh, it has been cold here! I forgot to turn on the heater last night, and it was 62 in our house when my hubs woke up -brrr! Ooh, let us know how that machine works out. My daughter would LOVE one. and it rocks, big time. My 8yr old is learning how to sew on it, and I feel confident that it will be hers until my 2 year old is big enough to use it. I love that pillow - gorgeous colours. You should enter it into the Pillow Parties at Stitched in Colour and SMS. Great pillow, Darci! A beautiful mix of greens and aqua. Let us know what you decide for your daughter's machine...maybe I should get one for my daughter too. Your new pillow is fabulous! I love your new pillow, gorgeous colours, so fresh and happy. 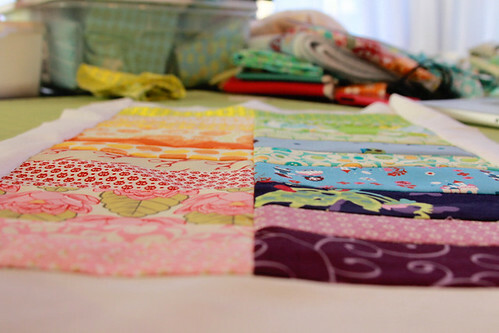 Your matching quilt is going to be fab! oh i did the same thing for ruby (my 4 yr old) for christmas ... i got her a machine similar to that (the one from joanns) and it didn't work at all. we ended up taking it back and ruby is happy to wait a bit longer for her OWN machine. til then, she helps in other ways (see my post a few days ago haha).